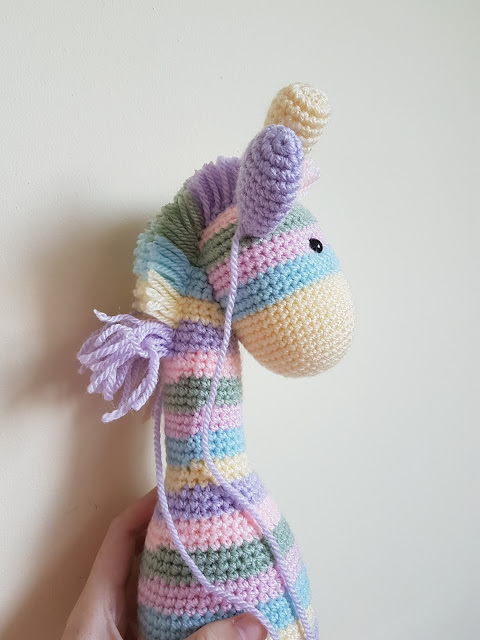 There are many similar designs floating around the online world, however my pattern is the only one out there with a rainbow yarn mane and realistic hooves (I think)! I was so happy to put my own Heart & Sew twist on a concept that's been done by, what feels like, every other designer out there. This is a big ami at nearly 16 inches tall (sitting!) but he works up quickly using aran/worsted weight yarn. As always, I am offering this pattern absolutely free. 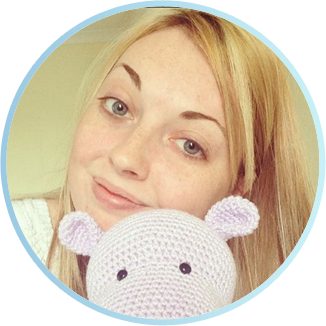 If you would like to thank/support me I'd be grateful if you could follow my blog in some way. Please post your own giraffe pictures on my Facebook page or the Heart & Sew Facebook group - I adore seeing you bring my patterns to life! I have used the Paintbox "Simply Aran" range, which is an acrylic, worsted weight yarn, to make my giraffe. 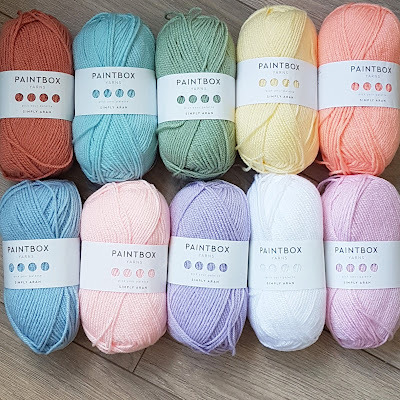 This yarn is only available at Love Crochet, but they ship world wide! Shipping to the USA is $4.95 and free when you spend over $60.00. You can check the exact shipping cost for your country here. I've included all the shade names below. You can read my full review of this yarn here. Difficulty: Moderate difficulty - Beginners may struggle with all the colour changes. Must know how to work in the round, change from rounds to rows, increase, invisible decrease, chain & change colours. Lots of beginners get stuck on round 4. This means 1sc in each of the first 2 stitches, 2sc in the next st (increase). Repeat until the end of the round. The next round is 1sc in each of the next 3 stitches, 2sc in next st (increase) etc. Top tip: Keep the "jog" from the colour changes to the underside of the head when attaching/embroidering eyes. When the head is sewed to the body the colour changes will be hidden underneath for seemingly perfect stripes! Slip stitch into the next st and fasten off leaving a long tail for sewing. Do not stuff ears. Slip stitch into next st and fasten off leaving a long tail for sewing. Stuff horns. Start stuffing the body, adding a little more stuffing after every few rows as you crochet. Now we change from working in rounds, to working in rows! This is so we can easily sew our giraffe head on at a downwards angle. Fasten off leaving a long tail for sewing. Stuff the body & neck. When you sew the head to the neck: You may have trouble stuffing the very top of the neck fully. To combat this start sewing the head in place leaving the very top of the neck free of stuffing. Before you sew all the way around to secure the neck, stop sewing and stuff the rest of the neck through the remaining hole until you are happy! Continue sewing to close the hole. From now on we will change colours every 3 rounds. Starting in blue, then pink, green, peach, purple, yellow, and finally blue. Slip stitch into the next st and fasten off leaving a long tail for sewing. Stuff arms. The bottom of the yellow hoof should be completely flat so don't over stuff his hoof! From now on we will change colours every 3 rows. Starting in blue, then pink, green, peach, purple, yellow, blue, pink and finally green. Slip stitch into the next st and fasten off leaving a long tail for sewing. Stuff legs. The bottom of the yellow hoof should be completely flat so don't over stuff his hoof! The following is the easiest order I have found to sew your ami together. Top tip: Keep colour changes to the back of your giraffe, for seemingly perfect strips! 1. Sew the horns to the head. They should stand up completely straight at the top of the head. 2. Sew the ears at either side of the head. They should stick out almost completely horizontally from the side of the head. 3. Sew the head to the neck. The head is sewn on at a downwards angle, the back of the head should sit almost ontop of the blue rows at the top of the neck. The back of the head should line up perfectly with the back of the neck and not stick out past the neck. 4. Sew the arms to the body. The are sewn to the top of the last purple round just before the neck starts. 5. Decide whether you want your giraffe to sit or stand and sew the legs in place accordingly. Now your giraffe is sewn together all we have to do is shape the hooves and attach the mane. Please see the instructions for these steps below. The hooves are created by tying a length of yarn around the front of the foot. Use this same technique for both the arms and the legs. 1. Take a long length of yellow yarn on your yarn needle. Insert needle through the middle of the magic circle on the bottom of the foot and bring yarn out again in the middle of the second last yellow row of the hoof. Important: Leave a decent length of the end of your yarn sticking out the bottom of the magic circle! 2. Take that same length of yarn through the foot again the exact same way at the exact same holes/places as step one. 3. You should have 2 yarn tails sticking out of the hoof now. One coming from the magic circle and one at the top of the hoof. 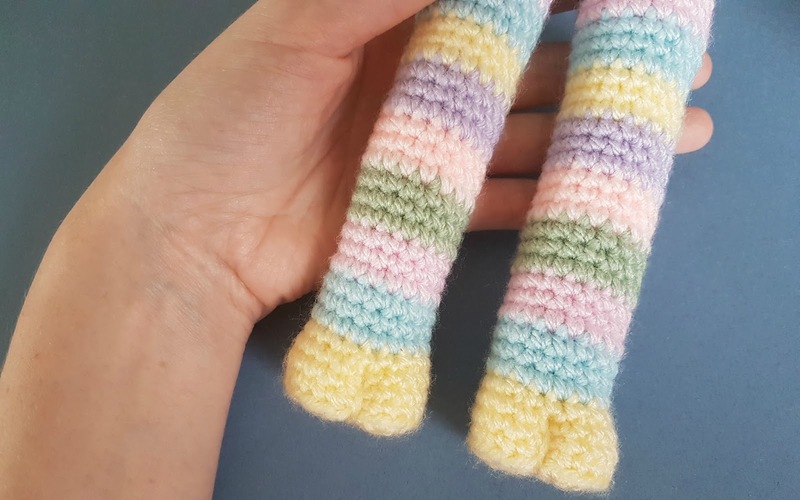 Take these 2 yarn tails and pull them as tight as you can to shape the hoof! 4. Once you have the hoof the shape you desire tie the two yarn tails together in a knot to secure the shape. Hide the left over yarn tails inside your giraffe using the yarn needle. Attaching the mane is simple although a little time consuming! We are going to attach 3 rows of yarn in each sections matching colour. 1. To create yarn pieces of all the same length, hold your hand as if you were going to shake someones hand. Wrap desired colour of yarn around the 4 fingers of your hand (excluding the thumb) roughly 20 times. More yarn can be made later if you don't make enough, try not to waste precious yarn! 2. Slip the whole loop of yarn off your hand and cut once at the top of the loop through every strand. You should now have several strands of yarn all roughly the same size. 3. Insert hook into stitch in the neck you would like to attach yarn to. Your hook should be pointing down towards the bottom of your giraffe with the handle pointing to the top of his head as pictured. 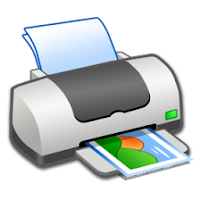 It is a good idea to start from the top of the giraffes head, between his horns, and work downwards. 4. Folding the strand in half, pull the strand through the stitch at the centre point to create a loop. Try to keep both ends of the strand the same length as you do this. 5. Pull both ends of the strand through the loop created and pull as tight at you can to secure strand to the neck. 6. Repeat step 5 in the stitch directly next to your existing hair strand. Your giraffe will look better if you keep the strands in neat rows, with the same number of hair strands in every row. 7. Keep attaching hair all the way down to the bottom of the neck changing colours as the neck does. 8. Once all hair is attached, trim to the desired length. Cut all strands the exact same length and remember - giraffe's have short manes! And that my dear friends, concludes another Heart & Sew pattern. 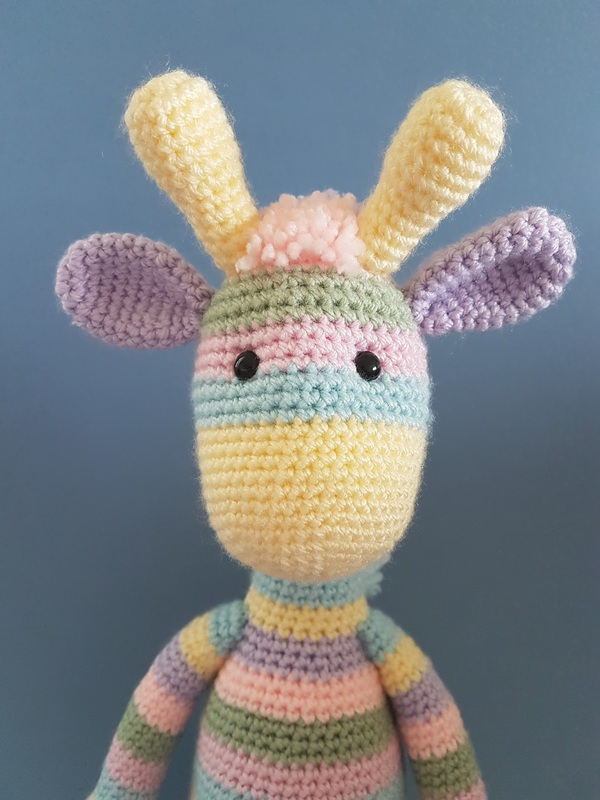 I hope you enjoyed making your own giraffe and will be following along for my next free crochet pattern! You've poured your heart into this adorable giraffe and it shows-thank you! He's absolutely gorgeous and the pattern is so well written. Thank you so much for this. que blog belíssimo e trabalho fantástico !! I want to save this pattern but do not have a printer so tried to cut and paste but does not work with your site. Could you please advise me how to do this as I would like to make this asap. Thanks for the wonderful pattern.